The Atlanta Braves used five runs in the bottom of the sixth inning to power past the Miami Marlins 9-1 on Monday afternoon at SunTrust Park in Cumberland. Leading the way for the Braves was rookie Touki Toussaint (1-0), as the touted 22-year old right handed thrower from Pembroke Pines, Florida lasted six innings while allowing one earned run on two hits, conceding two walks and striking out a team high four batters for the game. This was the first contest of a double-header between the two squads. Toussaint was drafted by the Arizona Diamondbacks in 2014 and has been one of the key pieces of the Atlanta farm system after the Braves absolutely stole him in a one-sided deal with the Diamondbacks. The 22-year old only struggled in the second inning on his debut and the Atlanta pitching staff continues to look deeper and deeper. Atlanta combined for a three hitter over the Marlins in the opening game of the double header. In the second game of the day Mike Foltynewicz (10-7) was equally impressive allowing a single run on five hits and three walks while striking out seven over eight innings. 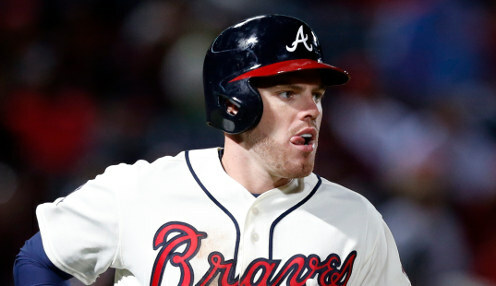 The 26-year old right-hander picked up his third consecutive victory with Ronald Acuna Jr. and Freddie Freeman going deep in support. Acuna hit lead off home runs in both games to help pace the Braves who now lead the Philadelphia Phillies by a game in the National League East Division race. The Braves are 4999/1 to win the National League with the Phillies 4999/1 and the Milwaukee Brewers are priced at 6/5.